24 Then Jesus said to his disciples, “If anyone wants to follow after me, let him deny himself, take up his cross, and follow me. 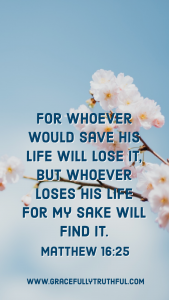 25 For whoever wants to save his life will lose it, but whoever loses his life because of me will find it. 26 For what will it benefit someone if he gains the whole world yet loses his life? Or what will anyone give in exchange for his life? 1) In what ways are we called to “deny ourselves”? 2) How do we “lose” our lives because of Jesus? 3) What point is Jesus making with His questions in verse 26? To be a disciple in Jesus’ day, was to be an apprentice. Young Jewish boys, whose fathers wanted them to become religious leaders, would spend their days following specific rabbis, copying what they did and learning from them. Over time, their entire identities would become shaped by the teachings and lifestyles of these rabbinic leaders. They had to be willing to give up everything about themselves in order to be molded and shaped in this apprenticing relationship. With Jesus, the disciples did not come to Him, rather He chose them. And in His choosing, He chose fishermen and tax collectors, those least likely to become religious leaders. He was turning the world upside down. The then-current idea of apprenticeship would take on a deeper meaning as Jesus drew His disciples out of their current lives to give them all new ones, lives they didn’t even know they wanted. He was inviting them to drop their old life for an entirely new one that required full commitment. James and John and other disciples were fishermen by trade before Jesus called them. They owned the family business with their father and likely would be handed down the business when their father passed. They had dreams. Lives. Goals. Matthew (or Levi) was a tax collector. He had education, wealth, a reputation, and was seemingly doing quite well with his course in life. But Jesus’ invitation to become His disciple came, and everything changed as their lives were turned upside down. James and John immediately left their nets, the huge cash flow of fish they had just caught, their father, and the business they were to inherit. Matthew also immediately left his money changing tables, his profitable business, and his reputation to follow Jesus. These men were “losing their lives” for Christ. They were giving up their ideas for how their lives should go as they surrendered their plans to Jesus. We only have one and if we do not care for it, no one else will, no one else even has the ability to do so. We are the stewards of our souls. The essence inside of us, that makes us…”us”. Our will, emotions, hopes, dreams, fears, all of it is wrapped up in our soul. To lose the soul is to lose everything, it is to lose “life” as the word is translated in the passage above. All would be meaningless without a soul, so it would seem of utmost importance to both care for the soul now on earth and for eternity. Jesus’ words imply that our souls can indeed be in danger of being lost. “For what will it benefit someone if he gains the whole world yet loses his life (soul)?” None can buy back their own soul after having lost it, it’s simply gone forever. With this weighty understanding, the supreme importance of following Jesus is brought into perspective. 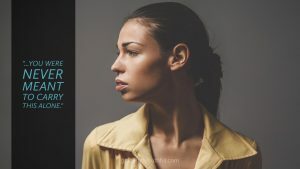 Choosing Jesus isn’t a matter of planning for retirement or whether we like attending church or have an aversion to moral decay, rather the eternal destiny of our souls hangs on the balance of what we do with our lives. Will we lose them for Christ or hold onto them for ourselves, finding in the end that we really couldn’t grasp them anyways? Jesus’ offer for discipleship extends far beyond the first century to our own. He is still choosing disciples; He has extended His offer for new life to each one of us! But there is a cost we must consider. Luke recounts Jesus teaching, “whoever does not bear his own cross and come after me cannot be my disciple.” (Luke 14:27). This “cross” signifies the crucifixion of one’s self, our desires and the way of life that was common to us before coming to Christ. When Jesus, the great Rabbi, or disciple-maker, extends His invitation, He brings newness of life that will overrun the former way of living. The old has gone, the new has come! (2 Corinthians 5:17) If you’re a disciple of Jesus, what “old ways” of thinking and living are you still holding onto? Where are you clinging to the safety of familiarity rather than surrendering your ways to the Master? The cost seems great indeed, but the reward is infinitely greater than the sacrifice! 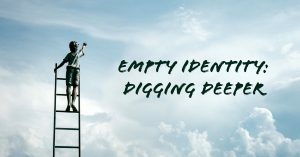 For Gomer, in yesterday’s Journey Study, “denying herself” would have meant exchanging the empty identities she carried for the love and acceptance she was being offered in Hosea. Luke’s gospel tells of Jesus inviting some to follow Him, but they replied with excuses. Family matters, other relationships, other priorities, these were their excuses and Jesus responded by warning them that unless they were “all in” for becoming a disciple of Jesus, then they had no place in His kingdom. Following Jesus will cost us our lives, but He gives His own in exchange. You will never find a genuine Christ-follower who, after choosing to “lose their life” for Jesus is met with regret. The fullness that Jesus brings satisfies every desire we have in ways that we never dreamed possible the more that we choose to surrender to Him. Whatever your passions, your dreams, your talents, your job, or your social status, Christ is inviting you to lose your life and find full satisfaction in what He will bring! Does it mean all will become pastors and teachers? Not at all, but it does mean He will shift your focus to amplify His glory and as He brings you good. 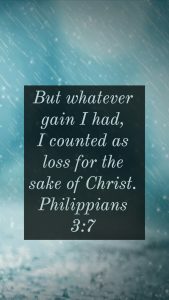 Losing your life for Christ results in truly finding it! In yesterday’s Journey Study we see that Israel “chose to be her own savior and lost everything.” This is exactly the picture portrayed here in Matthew by Christ’s words and it should motivate us to consider what we are chasing, why we are chasing it, and if the investment of our lives is worth the price of our souls. What we give our lives to, the manner we do it in, and the motivation of our doing, is the proof of who the Master of our souls is. Have we lost our lives for Christ or are we trying to hold onto control while still trying to make our lives appear Christian-like? Only if our lives, our very souls, are turned over to Jesus, allowing Him to bring us real life and guide us with how to steward our lives, will the things we do in this life even matter. See all past studies in Bride! Over the past few weeks, we’ve discussed so many eves. Some were laden with joy, some with sadness. All were buoyed by the expectancy of a Great Change to come, regardless of context. 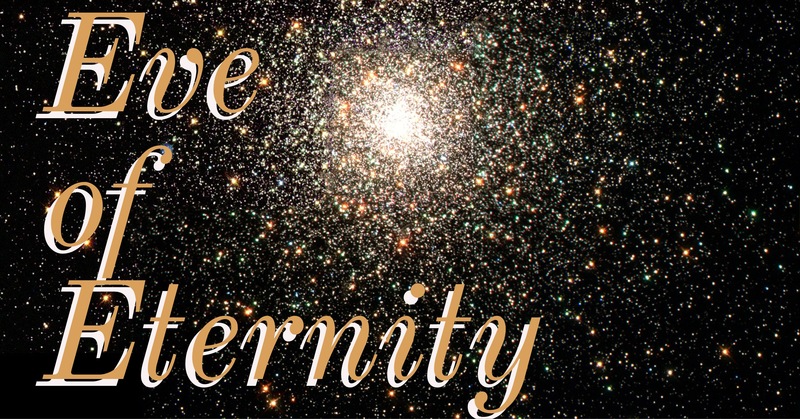 This eve, the Eve of Eternity, is no different. Friends, this life we’re living right now, today? 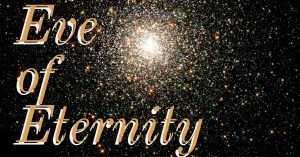 We are in the Eve of Eternity. Sometimes it feels like this life is so basic, so routine. We wake up, make the coffee, do the work, make the dinner, go to bed. I get it. But friends, this is our Eve. These days. These hours. These minutes. If we were each being honest, we would all agree that our daily routines and tasks seem to take over so much of our time, thoughts and energy. Our intentions may be golden, but we are so easily pulled away. We set alarms, set aside time, set aside our goals and to dos so we can spend time in His presence without outside distraction…for our 30 minutes or one hour…but things get busy, children start crying, our boss moves up the deadline, our car won’t start, fill-in-your blank. As we discussed and shared throughout Pause, most of us find that our challenge lies in actively making space for the Kingdom in our daily lives…but Loves, is that really what we are called to do in these final days? Or are we called to craft a daily life that revolves around the Kingdom? 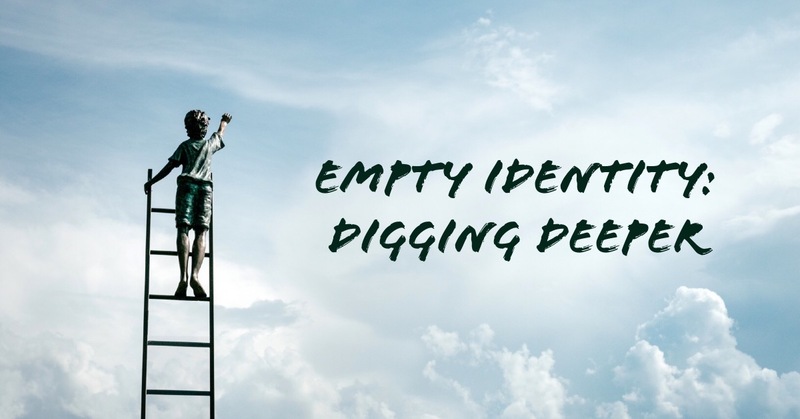 The thing is, we exist in this crazy tension between our identity in Christ and where our citizenship lies, versus the fallen world we currently live in. Our spirit is at constant war within us, fighting against the flesh and yearning for the holy, because in Christ we are made holy. because in Christ we are made clean. because through Christ we are sent to heal. because Christ commissioned us, you and me, to reach them. We live in this Eve in these imperfect bodies with imperfect desires, knowing that a perfect body awaits us, and friends? It’s really hard to reconcile that sometimes. our Eve will be over. And when that time comes, regardless of whether it’s when Jesus returns or we fade as the flowers, will we be able to say that we pursued passionate relationship with our Jesus in our Eve? Will the record of our lives show that we built our earthly life around our calling in Him? 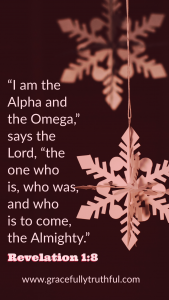 With all the expectancy and hope, faith and obedience due the Eve of the return of our King? Or will we be caught unaware, carving out space for Him in the middle of our busy? When I was a little girl, Jesus’ return seemed so scary to me. I could blame it on the Left Behind books, but there was actually a particular passage of Scripture that always left me worried. The thought of Jesus’ return coming “like a thief in the night” stood in stark contrast to the God of my Bible stories and the Father I had grown to know. I couldn’t reconcile the two, and it left me feeling anxious. Many nights, I laid awake, thinking, worrying and waiting. Why would He sneak in that way? I thought He was clear in His commandments and laws, so why would this be so different from His nature? Maybe He isn’t Who I think He is. Maybe I don’t really know Him at all. Isn’t that just how the enemy loves to sneak in? But friends? I was missing the whole point of that passage! You are not in the dark, so you will not be surprised! You are not destined for wrath, but for salvation! Paul goes on to exhort us to remain vigilant and aware, keeping our eyes open. He isn’t talking about our physical wakefulness here. Whether our earthly bodies die or Jesus returns, we have salvation! But in the meantime, this walking-out-the-Kingdom stuff in our Eve of Eternity? It’s not for the faint-hearted, friends. We need to center our lives on Christ to make it through. We need to live outward focused lives, sharing Jesus generously with others through our words, but more so through our actions. We need each other; we need to adopt, uphold and encourage the sweet community that Jesus modeled with His disciples. Our Eve of Eternity is similar to the other eves we’ve journeyed, but there is one stark difference: it is our final eve. Our one shot to fulfill all that He calls us to do. The Word is clear in that no one knows the day or hour, but we do know He will fulfill His promise to us. Today I am issuing a challenge to each of us, myself included. As we examine how we are living out our Eve of Eternity, think about those who do not have personal relationship with Jesus whom God has placed in our circles. They could be our barista, our cashier, our librarian, or our next door neighbor. Let’s write those names down and begin to pray for Holy Spirit to reveal and appoint opportunities to do life with them and draw them into community with us! Thanks for joining us today as we journeyed into Eve Week Three! Don’t miss out on the discussion below – we’d love to hear your thoughts! Looking for yesterday’s Journey Post? 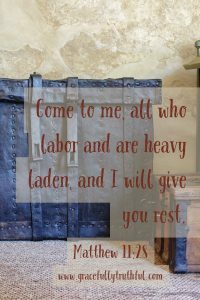 Check out For The Weary! 1) What is the significance of the 3 action verbs at the beginning of this verse? 2) What are the “ancient paths” and how do we walk in them? 3) In what ways does this “Ancient Path” bring “rest for our souls”? Anytime you see multiple verbs in a verse in Scripture, it’s a good indicator to slow down and pay attention! “Stand”, “Look”, and “Ask” are all pro-active verbs. Think about them as playing “defense” in a sports game. In the verses and chapters prior to 6:16, God is speaking to Jeremiah about the rebellious and adulterous ways that Israel has disobeyed and turned away from the Lord God. And it breaks God’s heart! “Thus says the Lord, Stand…look…ask!” He wants his people to stop going with the flow and seeing sin as normal; He’s calling them to take an active role in seeking Him and repenting from sin. The ancient paths refer to the Law of Moses, which are the Ten Commandments. God called Israel to walk in His ways, to live life according to His plan, not because He was a cruel, egotistical God, but because He Is Good and He knows what’s best. He promised to bless Israel as a nation if they lived life under God’s rule. Israel was headed into some pretty serious consequences as a nation because of their disobedience and rebellion against God. Destruction and death were waiting for them and God spent significant time and effort to warn them over and over about what was coming, but they refused. As it says in the last part of this verse, “We will not walk in it.” God was calling them into life, but they chose death. These action words remind me of the verbs used in Proverbs 1-7 as the author is urging his audience to seek wholeheartedly after God and His wisdom. We are not called to be mediocre Christ-followers, happy enough to allow sin to grow and eventually run rampant in our lives and those around us. We are called to Stand, Look, and Ask. Check your heart for sinful motives, your life for actions and words that don’t bring glory to God, and check to see if your everyday choices are propagating sin or defensively standing against it as you actively follow Jesus! A quick look at this, seemingly simple list of 10, makes us realize how quickly we fail the “righteousness of God” litmus test. If you’ve ever lied or stolen or lusted in you heart, you’ve broken the Ten Commandments, which makes you and me imperfect sinners. No amount of “good deeds” on our part will ever be able to bridge the gap between us and God because of our sin. Jesus came to fulfill the Law of Moses perfectly because we never could; He kept every single one of those Ten Laws for us. And then He gave us one command that summed them all up, “Love the Lord your God with all your heart, soul, and mind….Love your neighbor as yourself. All the Law and prophets depend on these two commandments.” If we love God wholeheartedly and give Him our hearts, and then love other people as a result, we will be walking in the paths that God has been urging His people to do from the beginning of time! Just as God was calling His people to please, follow His path for life rather than turn towards death and disobedience, so He calls out to us. Rest for our souls, rest in our everyday, rest in our relationships, it can be ours to the fullest, but the choice is ours. What will we do with the urging voice in our ear? Only when we seek Him out, choose to love Him with everything we are, and allow His love to overflow into our everyday lives can we find the sweet, satisfying rest that we long for. Thanks for joining us today as we journeyed into Rested Week Two! The woman crossed the platform gracefully. Her heels clicked softly as she stepped up to the podium and adjusted the microphone. Her makeup was perfect; every hair was in place. Her attire was vibrant and her smile genuine. However, as she began to speak, all thoughts of her appearance vanished from my mind as I was drawn into her story. My heart ached through most of it. I was quickly convinced that she was a hero. She had suffered incredible physical, mental and emotional abuse at the hands of her own husband. The man who had promised to love her and cherish her had violated the sacred trust she placed in him…to the point of her own near-death. When she approached her father and family for help, they refused her. Citing cultural excuses, they turned their backs to her. Worse, they even helped him find her again. The woman’s voice resonated with strength, courage, and undeniably…love. When she said that she had forgiven the man that had taken so much from her, her honesty was unquestionable. She had been dealt some of the ugliest, darkest cards of humanity, but through the grace of God she had survived, thrived, and was actively working with a team to rescue women in similar situations all around the globe. 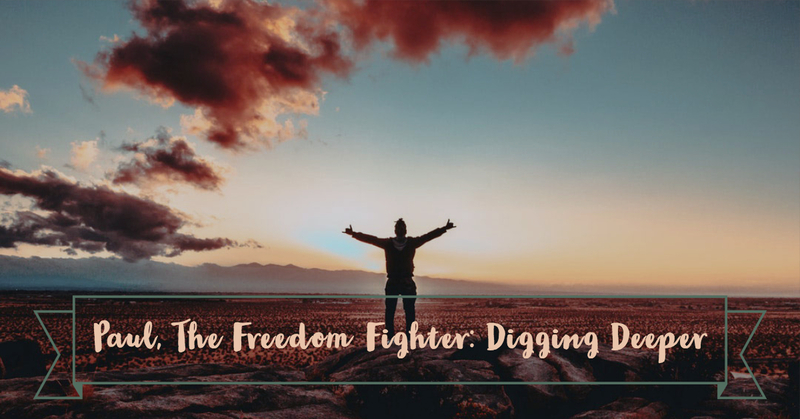 I marveled over how God had taken a woman who had suffered such tragedy and molded her into the brave, eloquent speaker who stood before us that day. I wiped tears from my own cheeks several times, and the audience was silent, save the occasional muffled sob. We all clapped loudly when she finished speaking. I wish I could help people like she does! The thought flitted through my mind before I realized what was happening. Next to the real life-or-death difference she was making in the world, my own day-to-day giftings seemed miniscule by comparison. I shivered at the thought of teaching crowds of people and sharing such intimate and harrowing experiences…public speaking was definitely not my strong suit. Nonetheless, I allowed my own giftings of encouragement and leadership to seem less important at that moment. Although I was not jealous of her life or experiences, my mental comparison was wrong. How often have each of us compared our own giftings to those of another? we are ultimately questioning His sovereignty. 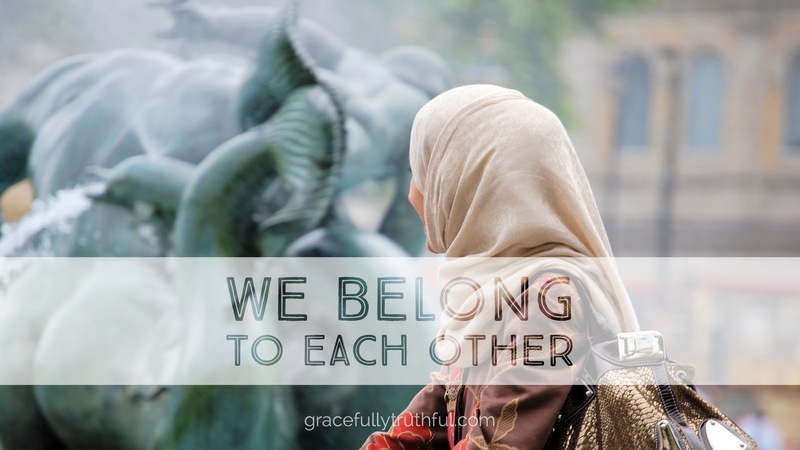 we forget that we belong to each other…and to Him. He created each of us and designed every person for a specific purpose within the Body of His Church. What we often fail to realize is that when we deny the giftings He placed within us, we are hurting ourselves as well as the church at large. Rather than compare our gifts with those of another, maybe we should try on trust for a change. Maybe we should try being honest with ourselves, communicating with God about His purpose in giving those gifts to us, and how He would have us walk in them. Rather than measure ourselves against what we may deem “more important”, perhaps we should use His word as our barometer. His heart is that each of us will choose to be repurposed in His image and to walk in the gifts He has given us with love. 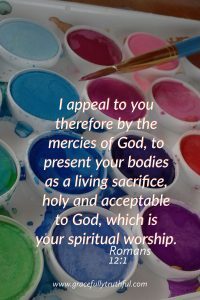 When we each choose to accept our unique giftings and seek ways we can walk in them, we will begin to see incredible breakthrough in the body of Christ! and we will begin functioning as the discipling community He intended us to be. Our influence with the world around us will become greater and will draw in the lost and the hurting people who are searching for belonging, authenticity, and safe refuge in Christ. Try this Survey for some guidance. Thanks for joining us today as we journeyed into Repurposed Week Two! Don’t miss out on the discussion below – we’d love to hear your thoughts!